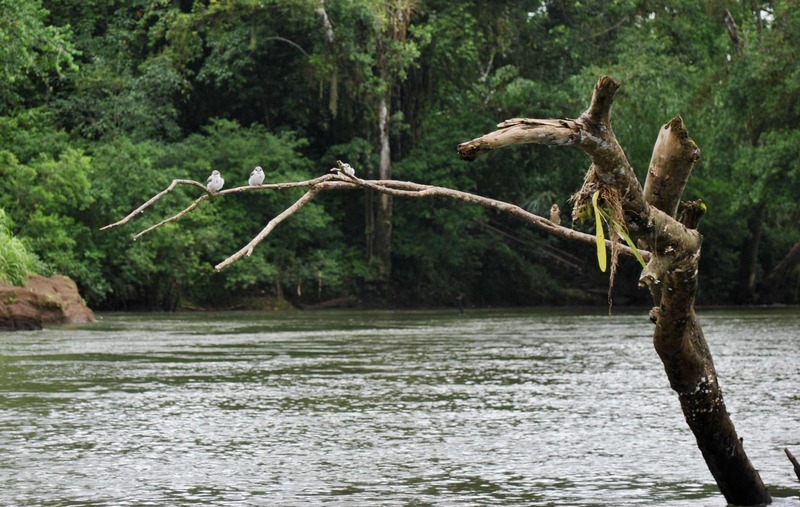 Birds perch on a branch from a fallen tree in the Puerto Viejo River. 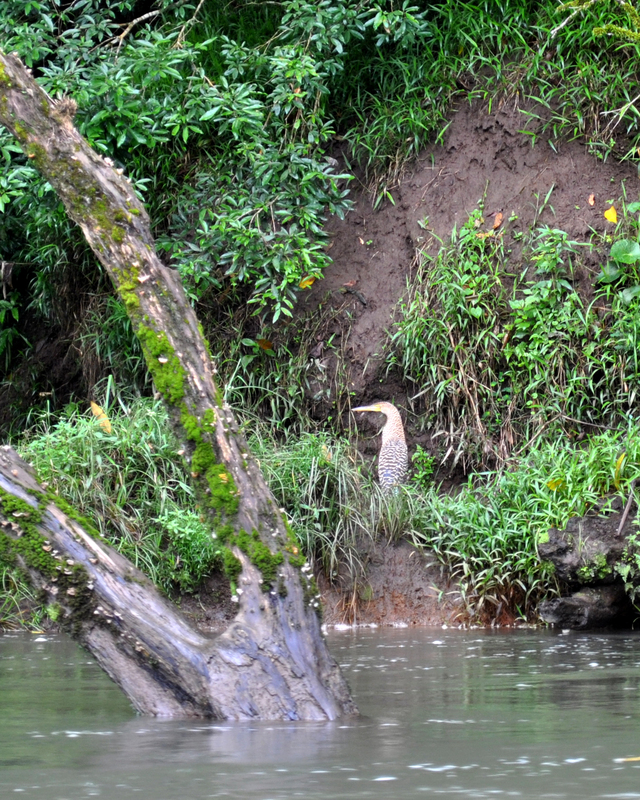 Drifting along the murky waters of the Puerto Viejo River, we have our cameras ready. We listen to the low hum of the boat’s engine until it suddenly cuts off and the driver points. Turning our heads to the right we spot a Tiger Heron. Shutter clicks sound as we capture the moment. We know this is a rare one. The fourth weekend of July our environmental reporting class stayed in Sarapiquí, Costa Rica, at the La Selva Biological Station. The Biological Station is a private reserve operated by The Organization for Tropical Studies. But more importantly it works in conjunction with the San Juan – La Selva Biological Corridor for the preservation of various bird species. The San Juan – La Selva Biological Corridor connects Indio Maíz Biological Reserve in Nicaragua with the Central Volcanic Cordillera Range System in Costa Rica, creating a vast land mass preserving migration patterns of birds. It was founded in November 2001 with the help of the Rainforest Biodiversity Group along with other conservation groups. Tiger Heron on the bank of the river. The Rainforest Biodiversity Group, formerly known as Friends of the Great Green Macaw, orginally worked to establish the biological corridor because it is the last area where the Almendro tree, home to the Great Green Macaw, is prominent. With just over 200 of its kind left, this macaw is extremely endangered. Brenna Goth, a student in the environmental reporting class, was lucky enough to see a flock of Great Green Macaws while reporting near the Terra Hermosa Animal Sanctuary. Because sightings of the Great Green Macaw are more common around the La Selva Biological Station, it is listed as the number 3 destination on the Costa Rican Bird Route. The Costa Rican Bird Route was established by the Rainforest Biodiversity Group as an ecotourism project allowing bird-watchers a chance to see exotic birds. Because many species of birds are endangered due to loss of habitat, birds have become the symbol of rain forest conservation. Deforestation is the leading cause of habitat loss for birds in Costa Rica. “A lot of birds are forest specialists and won´t cross light gaps,´´said Mike Wells, the resident “bird man´´ studying at the La Selva Biological Station. Wells, who is researching social behavior of birds, is referring to the spaces created by cutting down trees – sometimes even for telephone poles – or resulting from natural causes such as wind. He said that some species are unable to compensate physiologically to the changes. For example, their eyes cannot adjust to light increases. This means most birds are limited to a space abundant with trees. Projects like the Costa Rican Bird Route add rain forest preserves. Over 3,500 acres of rain forest were added to the San Juan – La Selva Biological Corridor, furthering rain forest connectivity. Our class also hiked through the rain forest with a guide and we saw a woodcreeper, a bird similar to a woodpecker except that it circles the tree looking for insects to eat rather than drilling a hole into it. We saw wild turkeys –– a male calling out for a mate while the female sat in a tree not a hundred feet away. The Great Tinamou, Montezuma’s Oropendola, kingfishers, hummingbirds, and Green Ibis were among other birds we saw. 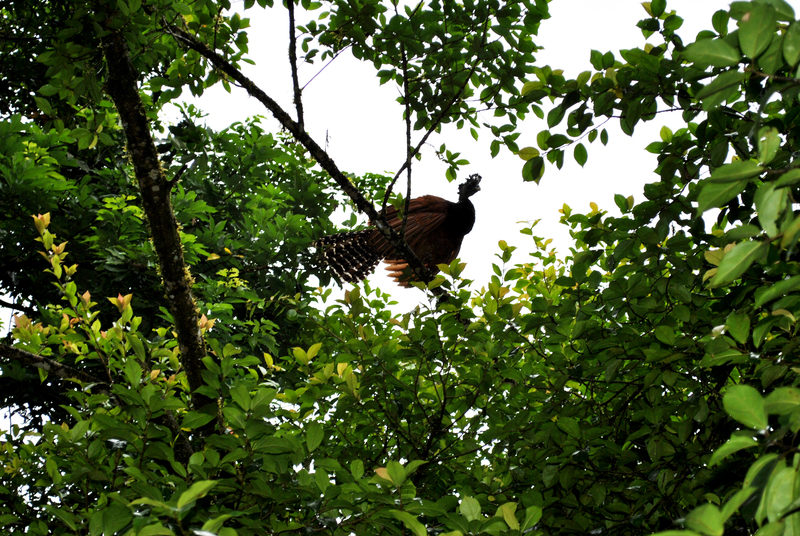 A female Great Curassow, or wild turkey, watches the male Curassow. in the grass below. Conservation is essential in saving bird species from extinction and because of places like La Selva Biological Station, we are able to see toucans perching just outside our bedrooms. In 1997 I was present in Costa Rica at conversations about the migration corridor that was being planned. I’m so glad to know it is in place! Thanks for reporting.